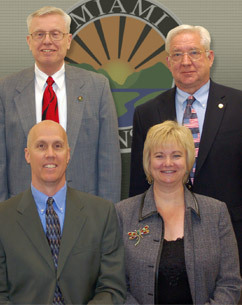 Miami Township is governed by three Trustees and a Fiscal Officer. The Board is responsible for, among other things, passing ordinances, adopting the annual budget, and appointing other boards and committees. All members are elected to their positions for four years on staggering cycles. The Trustees are elected to administer the affairs of township government as the representatives of the people and they hold their offices in trust for the people of the Township. The Trustees welcome residents to attend governmental meetings held on the second Monday (Worksessions • 8:30 am) and third Tuesday (Business Meetings • 7:00 pm) of each month at the Miami Township Civic Center located at 6101 Meijer Dr (45150). The minutes on the website are intended to be complete and accurate, however, official minutes are kept on paper in the Fiscal Office at the Miami Township	Administration building (6101 Meijer Dr • 45150) and are the ONLY approved minutes of Miami Township. All meetings are held at the Miami Township Civic Center (6101 Meijer Drive • 45150).